Crackle topcoats, matte polishes, foil effect polish – the list goes on. 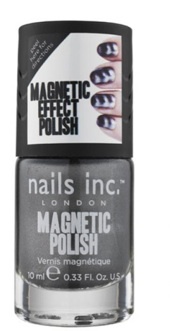 Just when you thought the brains behind nail polishes couldn’t do anything else, magnetic nail polishes hit the shelves. 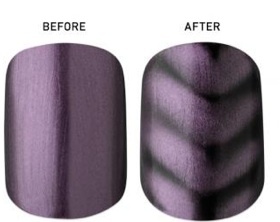 Magnetic nail polish is a special formula with integrated metallic particles which help to create unique nail art when a magnet is held over the nail. Whilst the polish is still wet, the iron particles will gravitate towards a magnet to create an interesting pattern. Nails Inc have released 3 magnetic nail polishes, all priced at £13 each (with £1 from every Nails Inc magnetic nail polish sold donated to The Prince’s Trust). If your budget won’t quite stretch to £13 then Boots brand 17 have their own version which is available in four beautiful metallic shades and come in at an affordable £5.99. Magnetized nail polishes are a fantastic way of creating quick, easy and sophisticated nail art from your own home and will give the perfect finishing touch to any festive season outfit.